Once your Gift Set arrives in the mail, there will be a voucher code inside to redeem for a custom personalized stamp design online. You will simply type in your code, pick your favorite from dozens of designs, personalize it, and type in your shipping info. That's it! You will NOT have to pay for shipping for your custom stamp design. "It was so easy to order my stamp design online! What a great gift!" ~ Kristin S.
Choose from hundreds of designs and personalize it the way you'd like it! The beauty of this gift is you can give it in lieu of a gift certificate and have something fun to wrap and give! ~ Great for special occasions like weddings, birth announcements, anniversaries, graduation, new home, holidays, etc. The redemption process is super easy! 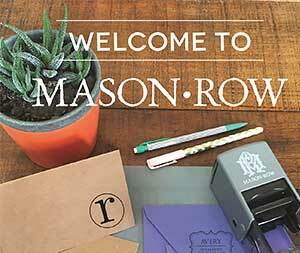 Go to redeem.masonrow.com on the web browser of your choice. Enter the redemption code exactly as it appears on the voucher inside the Gift Box. 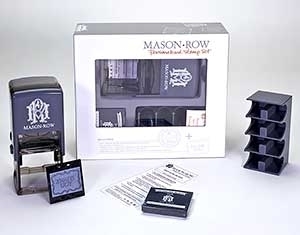 Select and Personalize the Embosser Design you would like from our many categories. Once you are satisfied with your design, click on Next, then click on the check box to confirm that you approve the design and click Finish. Enter your shipping address and submit the order. A confirmation of your order will be sent via email to the address you provide. Your Custom Stamp Design will ship in 5-7 bu­siness days! Once your Embosser Gift Set arrives, there is a voucher code inside to redeem for a custom personalized embosser design online. You will simply type in your code, pick your favorite from hundreds of designs, and personalize it. That's it! You will NOT have to pay for shipping for your custom embosser design. "This is such a awesome gift idea...my friend can pick out her own design and personalize it herself!" ~ Jacey W.